AudioQuest Rocket 11 review | What Hi-Fi? Love your hi-fi system but feel the need to give it a bit of a lift? If you haven’t already, you might want to invest in a better quality of speaker cable. AudioQuest’s Rocket 11 – on the budget end of its Rocket range at £12.50/m – could just be the thing to give your system a new lease of life. The first thing we like about the Rocket 11 is how flexible it is. Much like AudioQuest’s previous Award-winning FLX-SLiP 14/4, it’s easy to bend the malleable cable around tight corners to reach your kit without worrying about it breaking or getting damaged. The cables are handily labelled, too. Not only are the left and right cables marked, AudioQuest has helpfully noted which end goes into the amplifier and which end plugs into the speaker – it’s these little touches that make the Rocket 11 all the more easy and appealing to use. They’re also designed so that you can use them in a single-wired or bi-wired configuration if your system demands it, with the option to terminate them in banana plugs or spade connectors in store. Our review sample has banana plugs and comes in a smart white finish, though you can get the Rocket 11 in black too. AudioQuest has taken a lot of care with the configuration and quality of the conductors used inside the Rocket 11. It uses semi-solid true-concentric conductors and long-grain copper – all to improve performance and reduce any interference that might degrade the sound. Of course, none of this would make a jot of difference if the Rocket 11 cable didn’t have a positive impact on your system’s performance. We connect the cable into our main reference system (a formidable ATC SCM 50 speakers, GamuT D3i/D200i amplifier and Naim NDS/555PS streamer combination) as well as in a more modest system comprising KEF Q350 speakers, Rega Brio amp and Marantz CD6006 UK Edition CD player – and the effect on our assembled systems is immediate. There’s a perceptible improvement in the way the systems perform when the Rocket 11 is plugged in, compared with rival speaker cables from Atlas and Chord Company. We play In The Cold, Cold Night by The White Stripes, and our system sounds stunningly clear, controlled and detailed. Guitar strings are pulled taut, leading edges are wonderfully crisp and clean, and the precise timing propels the song forward with a driving momentum. Vocals are packed with nuance and emotion, too. The precision of Meg White’s diction comes through with sparkling clarity. The Rocket 11s also guide our system into performing with a pleasing and punchy sense of dynamism that’s a joy to listen to. Stevie Nicks’s Edge Of Seventeen is delivered with the full, raw power of an air-punching power ballad, with while the playful clubbing rhythm of SBTRKT’s New Dorp New York charges along merrily. Listening with competitors such as the Award-winning Chord Company Clearway speaker cable (which is slightly cheaper at £10/m), our system sounds a bit richer, with a weightier emphasis on the basslines. But with the Rocket 11, our system knits musical elements together with more confidence and alacrity. We get a better sense of spaciousness, too. As we said in our review of the FLX-SLiP 14/4 a few years ago, the best thing this AudioQuest cable does is get out of the way and simply let you enjoy the music. At £12.50 per metre (before termination), it might sound a bit steep when you add up how many cables and the length you’ll need. 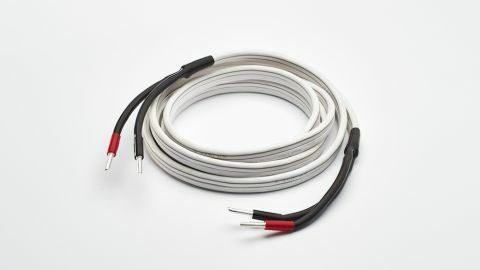 But if you’ve put a lot of care into your hi-fi system, it’s well worth investing in good quality speaker cables that will optimise its performance. And the Rocket 11 speaker cable is well worth that investment.